Smok TFV8 Baby Beast Reviewed (2018) - A Small But Powerful Tank! Home → Tanks → Sub-Ohm → Smok TFV8 Baby Beast – A Small Sized Tank with Beastly Performance! 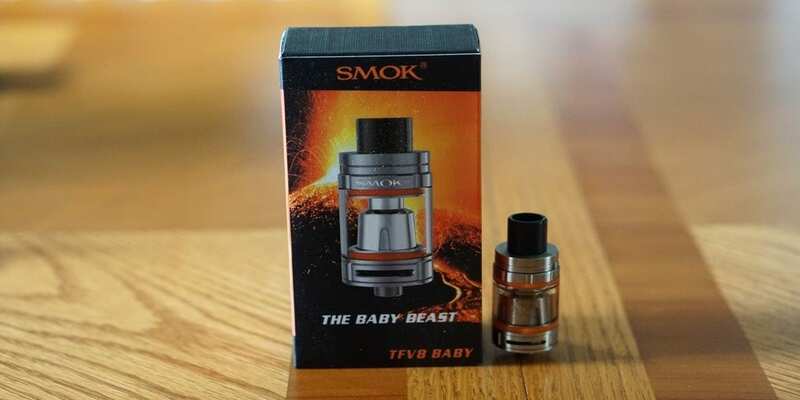 Smok TFV8 Baby Beast – A Small Sized Tank with Beastly Performance! Smok has been releasing tons of products lately, and this right here is one of the latest tanks released by Smok. The bigger, and first Smok TFV8 Subohm Tank was highly successful, and just like the original TFV4, a smaller version is released afterwards. As we all know, subohm tanks are extremely popular at the moment, and I’m sure with this specific tank, vapers definitely have high hopes due to the success of the original TFV4 line. This is the review for the Smok TFV8 Baby Beast. I will go over the many different aspects of this tank, and tell you what I like and if there is anything I do not like about this subohm tank as well as tell you how it compares to the rest! When first taking the Smok TFV8 Baby Beast out of the original packaging, what I noticed was how small the actual tank was. Everyone knows that the Smok TFV8 Subohm Tank is quite large, and just seeing how small this tank is, I knew this would be a completely different vape experience. Honestly, this tank is quite small overall, and definitely smaller than most of the newer subohm tanks that are being released. The overall diameter of the Smok TFV8 Baby Beast is 22mm, so I knew right away it would look great on most devices I owned. 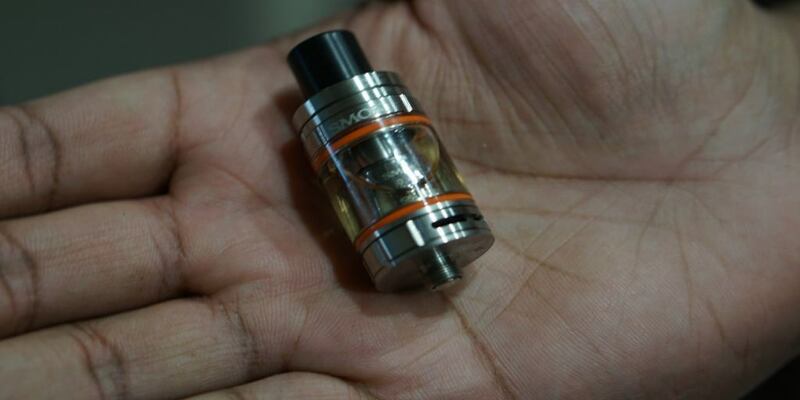 Since this tank is quite small, I already knew the e-liquid capacity wasn’t huge. In addition, since this subohm tank was in the TFV8 line, I already knew this tank would probably go through e-liquid quite quickly. This can surely be a con, but I will go more into detail with this specifically in the cons section down below. The packaging itself was relatively simple, and within the packaging you do receive an extra coil head,an additional glass section, and some extras such are spare o-rings. It was a huge pro for me that they included the extra glass, because I know many people break the glass on tanks quite often. Things just tend to happen sometimes, so with this extra glass section, at least you know you have a backup with this subohm tank. In addition, another thing I noticed was that the build quality was actually really good. I was surprised by how good the machining was on this tank, as I did not notice anything off. The threads were pretty smooth overall, and it surely felt of quality. Also, the top fill hinge was very easy to use, and open quite easily, but you did have to use just enough force to open it. This, I think was a great thing, because it was not wobbly, and felt secure, so you don’t have to worry about the hinge swinging open while this tank is in your pocket or purse. The delrin drip tip included is quite tall though. This can be a subjective con, but thankfully you are able to change it to something you prefer to use. This is definitely a pro, as many people like using their own customized 510 drip tip. The wide bore delrin drip seemed comfortable though, and did not bother me to the point where I felt I wanted to change it out. I actually prefer wide bore drip tips in comparison to normal smaller bore 510 drip tips. The airflow control ring moved easily as well, with no issues. It move easily enough, yet I felt that when using it, it would not just move around due to it being loose. The airflow control ring was definitely secure wherever it was positioned. The next thing I noticed when first looking at this subohm tank is that the coil heads were not huge by any means. It is surely bigger than some coil heads, say an Aspire Atlantis Coil Head in regards to the width, but it was not on the scale of the TFV8 or TFV4 coil heads for sure. Even though the coil heads were small in comparison to other Smok coil heads, I do feel that these coil heads were quite big for the tank’s size. I do not think this is a con, but I do think it is something to mention. Another huge pro for the Smok TFV8 Baby Beast was that there was hardly any machine oil. One rinse with soap and water was all it took for this tank to be ready to be vaped! So the main question for this tank is definitely how does it perform? Well I can say it definitely performs! I do like how this tank performs overall and will go over it more in detail down below! I do want to state though before getting any further, with either coil head; it did not take long to break in. I know this is something people definitely want to know, so I would say with maybe a half of a tank, the coils were broken in. The coils were fully broken in with just about a full tank, where I was getting full on flavor. The two coil heads included with this tank were the V8 Baby-Q2 Dual Coil 0.4 ohm, and the V8 Baby-T8 Octuple Coil 0.15 ohm. Each coil performed quite well, but there was a clear winner for me in regards to which performed better overall. The coil head I enjoyed using the most was the V8 Baby-Q2 Dual Coil 0.4 ohm. For some reason, the flavor was just better with this coil head. In addition, you did not need nearly as much wattage to get a nice, satisfying vape. The 0.15 ohm coil head performed great as well, but the flavor was lacking just a tad bit in comparison to the 0.4 ohm coil head. I do like the vape experience from this coil head as well, but like said previously, the 0.4 ohm coil head just simply out performed it. The flavor with the 0.4 ohm coil head was excellent, and definitely above average. The flavor is not as good as an RDA, but close enough where I felt satisfied with it. In addition, the vapor production was really good. The vapor production wasn’t as great as say the original TFV4 or the full sized TFV8, but it was definitely solid. If you are looking for a full blown cloud chasing tank, you’d probably be more interested in the TFV8 for sure, rather than this smaller version. For how I vape, I found that the best performance in regards to airflow was closed to about half way. This tank is definitely airy when it’s wide open, and cuts down in flavor when you have it set this way. The flavor was okay with it being wide open, but it definitely improved by a ton with it closed off a bit. Also, since I prefer a restricted lung hit, this was best for the way I vape. For the 0.4 ohm coil head, I found a very satisfying vape at about 55w. You can definitely go higher, but I felt that this was perfect in regards to warmth of the vapor and the overall performance. With this specific coil head, I put at least 60ml of e-liquid and it is still performing well. I do not notice any burnt taste, nor is the performance lacking in any way. This is surely another pro! With higher wattages such as 80w and above, it definitely could not keep up as well when chain vaping. At my preferred wattage, I could easily chain vape with no dry hits and it kept up like a champ! This would definitely be for both coil heads. It is important to note that I did use max VG e-liquid in the Smok TFV8 Baby Beast. Maybe with a slightly thinner e-liquid it could have easily handled higher wattage chain vaping. However, if you vape this tank often, but do not chain vape consistently, I do feel that higher wattages are no issue, and it kept up quite well overall. I did not notice a dry hit at higher wattages, but it certainly felt it was on the verge of it, hence is why I do think it cannot keep up quite as well with slightly lower wattages. If you do not chain vape often, then this is definitely not a concern. Filling this tank is quite easy, and quick. I love how easy it is to fill this tank, and this hinge system that Smok uses is definitely one of the better top fill designs in my opinion. Also, when closing the hinge, it firmly locks into place and you can surely feel when it does that. This is surely a huge pro! Speaking about e-liquid, this tank can definitely go through it quite quickly, especially at higher wattages. This is something I will get more into down below in the cons section. Also, I did not experience any leaking with this tank, which is another major pro. However, I did experience some slight seeping when the tank was laid on its side, but it was not a large amount of e-liquid. For the 0.15 ohm coil head, I found the optimal wattage was at about 75w. With this wattage, the flavor was good and the vapor production was solid. The included delrin drip tip was definitely comfortable to use. I still think that it is quite tall for this tank, but in regards to comfort, it was certainly comfortable to use. Overall, this tank is surely a performer. Both of the coil heads performed well, but the clear winner for me was the 0.4 ohm coil head. The airflow was nice and airy, and was definitely not turbulent in any way. Even though this tank performed quite well overall, it did have some cons which I will go over down below in the next section! Yes, the Smok TFV8 Baby Beast definitely has some cons to it. The first con is the e-liquid capacity, and how fast this tank can go through it. This subohm tank has a 3ml e-liquid capacity. I do think it is fine that this tank has a 3ml e-liquid capacity, especially given its size, but this tank really goes through juice quickly. The e-liquid capacity itself is not a huge con, as it is extremely easy to fill. 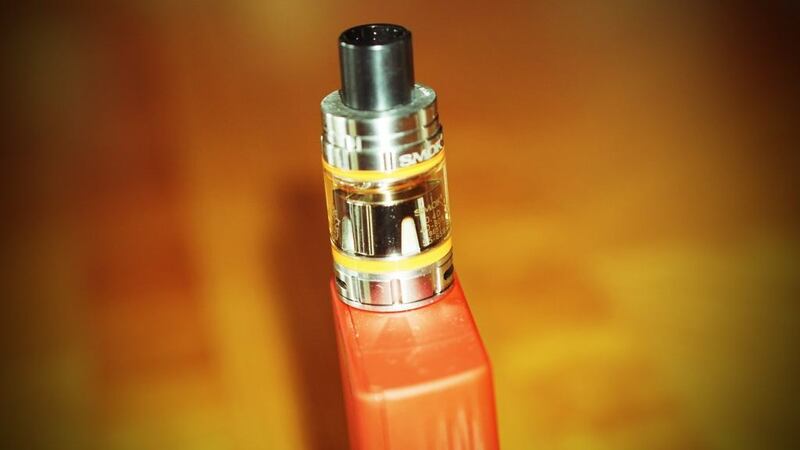 At higher wattages, you can probably empty the full 3ml tank in under an hour easily, especially when chain vaping. 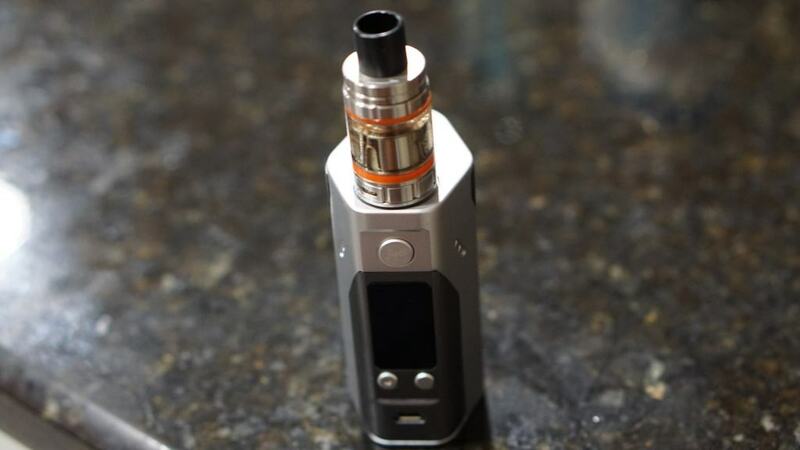 At my preferred wattage, a tank on average would last just about 2 hours of consistent vaping. A second con is that this tank does not include an RBA section. The RBA section is a separate purchase, and even though this tank is quite cheaper than the full sized TFV8, which does include an RBA section, I do think it would have been a nice addition if it did include one. However, given the price of the Smok TFV8 Baby Beast, I can see why it is not included, but this is definitely something worth mentioning. Another con is that this tank can get quite warm, especially if you are vaping often. Even the included delrin drip tip got slightly warm. It did not get extremely hot, but it did get warm enough where I felt it was uncomfortable, especially the tank itself. A subjective con is the included delrin drip tip. I just think it looks awkward simply, because it is tall and the tank itself is small. Like said before, it is comfortable to use, but I personally do not like how it looks. All in all, even though there are some slight cons to this tank, it does not take away from its incredible performance, which leads me into the next section, my conclusion! In conclusion, the Smok TFV8 Baby Beast Subohm Tank is a solid performer. The flavor on this tank is quite good, and the airflow is excellent. They include an extra spare glass section with this tank, which is another huge pro! The tank has a nice, compact design which I think is a great change in comparison to the full sized TFV8. This tank is definitely not a cloud chaser like the full sized TFV8, which some people may not like since it is in the TFV8 family of tanks. Honestly, I think Smok took the right direction for this tank. Making this subohm tank smaller overall, and introducing new coil heads that do not require as much power, just appeals to another crowd of vapers. In addition, if you are not fully aware of battery safety while subohm vaping, we recently published an article right here going over battery safety! While using subohm tanks such as this with lower resistance coils, it is always a good thing to know more about battery safety. Check out the link below, if you are interested! Click Here to Check out the Battery Safety Article! Like said previously, if you are looking for a full blown cloud chasing subohm tank, you would definitely be much more interested in the full sized TFV8. A huge pro for me, personally, was the fact that this tank did not leak on me at all. It never leaked when filling it nor when leaving it overnight with e-liquid in it. It did have some e-liquid residue when laid on its side, but nothing major, where I felt it was a concern. Even though there are tons of pros to this tank, it does have some slight cons. It does get warm when chain vaping, and even to an uncomfortable level at times. However, with all of the pros mentioned, I honestly looked past this con as it only happened when chain vaping consistently. All in all, for the price of this tank, it really is a winner and definitely beats some of the tanks I have recently used. Smok has definitely done a great job with this tank! This is one of the subohm tanks that I use daily, and I continue to use it up to this day simply, because it is just dependable. If you are looking for a solid performing subohm tank, I highly recommend checking out the Smok TFV8 Baby Beast! Thanks for reading!